CAI’s main laboratory and employees operate out of our Laredo office. Our consulting engineering firm was established in 1999. Carrillo & Associates, Inc., (CAI) is a multi-discipline organization licensed to perform construction material testing and engineering consulting. CAI has experienced American Concrete Institute (ACI), Texas Pavement Association (TPA), National Institute for Certification in Engineering Technologies (NICET) and nuclear gauge user certified, and dedicated technicians to providing quality prompt construction material testing and engineering services. Our final product presented to our clients will be considered an excellent product generated with integrity and honesty. Carrillo & Associates, Inc., is inspected by the US Army Corps of Engineers (USACE) on our laboratory procedures and engineering technicians every two years. Our testing equipment is calibrated yearly in order to provide quality testing services with rapid results. 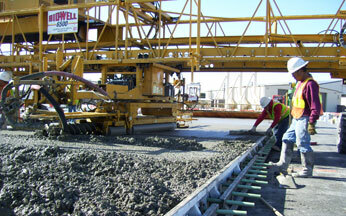 earthwork, asphalt, steel and concrete testing during construction. soil borings, laboratory testing, engineering analysis, recommendations regarding foundations, pavements, retaining walls and construction. site assessments and monitor well installations. foundations, retaining walls, and pavement distress. The primary purpose of the firm is to provide prompt accurate and comprehensive material testing, construction observations, geotechnical reports, environmental studies and engineering services. The company’s personnel have experience performing constructionmaterial testing on Texas Department of Transportation (TxDOT) projects, power plants, federal warehouses, government aircraft aprons, Border Patrol stations, Border Patrol checkpoints, military housing, hospitals, high rise hotels, libraries, city and county public works, Federal Aviation Administration (FAA) airports, US Army Corps of Engineers (USACE) civil and administrative projects, landfills, International Boundaries and Water Commission (IBWC), General Services Administration (GSA), municipal infrastructure, private residential housing, elevated parking garages, and Environmental Site Assessments (ESA). Carrillo & Associates, Inc. (CAI) is equipped with drilling rigs to perform dry or hollow stem borings. We can conduct drilling and sampling with our drilling rig up to 40 feet. In addition, with the assistance of our subcontractor drillers we can drill to much deeper depths. Our field crews have many years of experience working with various subsoil and groundwater conditions. Our commitment is to provide dependable service, the best and most up to date equipment and reliable drilling personnel. Carrillo & Associates, Inc. (CAI) has the capabilities to perform testing under controlled conditions in order to evaluate not only standardized test of materials but test new materials used in development and research. We are the only laboratory that is physically located in the Laredo area that is validated and inspected to provide professional material testing and engineering services to the US Army Corps of Engineers (USACE). Our tests will be conducted in accordance with ASTM, AASTHO or TxDOT standards. 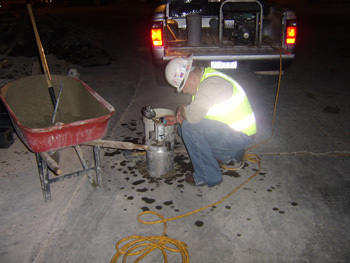 Concrete testing – slump, air, cylinders, beams, yield, coring, cement content, mix design, mix design verification, batch plant inspection and rebar inspection. Soil testing – in-place field density tests, moisture-density relationship (proctors), plasticity index (PI), gradations, soil cement/lime/fly ash stabilization, amount of material finer than the No. 200 sieve and geotechnical testing. Asphalt testing – in-place field density tests, cores, theoretical specific and gravity, bulk density, gradation and extraction, mix design and stability. Structural steel – weld inspection, A325 bolt torque, paint thickness.